Home » MagicMark Your Life Tribe » Love Letter to my Sisters » Check out my New Year’s Miracle! Check out my New Year’s Miracle! Happy New Year! Happy Self-love Day! Happy Valentine Day! and very happy, extraordinary magical Miracle Day! I’ve been rather quiet these holidays because I gave myself a resting retreat until mid January. Then I gave myself a writing and rehearsing retreat to start the year fresh and doing what I love most. I needed to fill myself with the joy of doing what I love in order that my light could overflow and shower you all year through. I want to share with you the miracle that I received just at the start of this New Year, to give you living proof that your intentions resonate in the universe and become material expressions, attracting that in which you place your attention. I call this your Miracle Days, when things you want, envision or imagine show up in little or big ways to boost your belief. Every Christmas, I meet with a couple of old friends and we dive deeply into what our Soul desires. Then we help each other refine and express our New Year resolution based on that Soul wisdom. It is usually not about doing, but about being and creating. My writing retreat ended on Sunday and today is my first day back to work. I hear a knock, open the door and there is a UPS guy with a package I was not expecting at all. I opened it and I found myself staring at a glowing star! 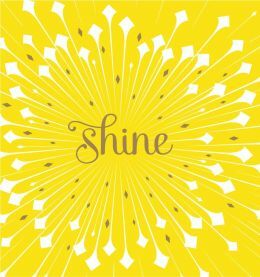 Someone has sent me a beautiful inspirational book entitled “Shine”, with a star in the cover. As a matter of fact, there’s a star in every page, and many are golden. Each beautiful page has an inspiring quote about shining your brilliance to the world. The universe is answering loud and clear. It is even giving me inspiration, words and images to fuel my intention. It is letting me know that I am in alignment with Divine Will and that it is happening. Now you may be asking: Where does this book come from? Didn’t you order it? No, I did not, and I don’t know the author or the publisher!!! At a logical level, I have no idea why and how this beautiful book got to me. At a Soul level, I am tantalizingly clear that it comes from the Divine. At a factual level, it has no note, letter or dedication other than a small print saying that it was written by someone called M. H. Clark and published by Compendium. And this is part of the message I want to leave you with as 2015 moves on. We often do not believe that our dream is possible for us because we cannot see how it could happen from where we stand. Don’t bring your logical mind into your manifestation. That’s the job of your passion, vision and imagination. Let your Soul and your delight guide you. Once you need to create a strategy or implement, then bring your logical mind in. But not before. If you’d already knew how to do your dream, it would not be something new and different because your logical mind can only remember, categorize, extrapolate and analyze. Your logical mind, which is the how-to mind, can only adapt the knowledge it already has on file to any new situation. But the situation has to have a reference point, a precedent, in order for your logical mind to be able to figure it out. Your Dream is completely new. It is something you have not experienced before. Therefore, it’s not in the files. That’s why your logical mind tells you that it is not real, not possible or even true. When this happens, tell your logical mind, that this is not its job, tell her to take a coffee break and call upon your heart to do the job. Keep your heart focused in your intent and your steps following the compass of your soul. Leave the rest to Spirit. Let the means to your Dream come directly from Spirit through its infinite channels. Your logical mind has just a handful of channels. Even your imagination, as vast as it is, do not possess as infinite a variety of channels as the Divine. Just make sure that you create the environment —both internally and externally— for the miracles that flow through those Divine Channels to reach you… and make sure to receive them with joy and gratitude. Some other folk would have received this book and start worrying that they did not order it or scrambling through the pages to find the author, or even getting paranoid that it did not have a note. That’s how we resist and repel the miracles we are praying for. Open your heart, your mind and your hands to receive the miracles. That’s the story of my shining star, now a book that I can read to inspire myself to publish the books I am getting ready right now for you… so that my star can brighten your days. PS. I found the book in Amazon. Take a look at it. It’s luminous!